March – I caught a sleeper train to Changchun. I was in a room with 5 big fat Chinese men, one of whom snored like crazy. He was in the bunk above me, and The Great Worrier thought it would collapse, he was so fat. Got to Changchun, and remembered how cold it was. Warmer than January, but still around minus 12. Met the fiance who had gone ahead of me a few days before, and we went to the registry office, expecting to complete everything that day. China is drowning in official paperwork and red stamps. 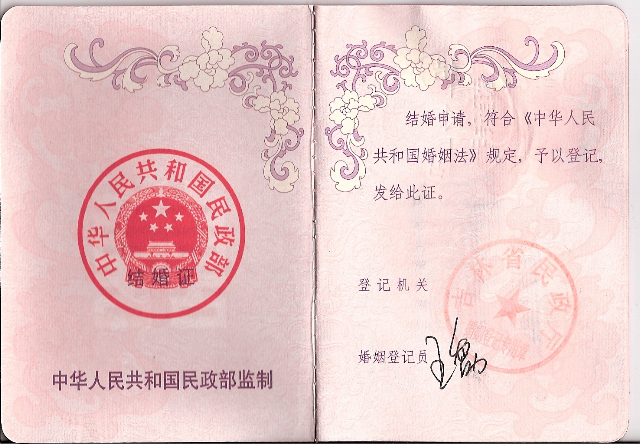 Turns out the red stamp on her “Hukou” (family book that lists your parents, siblings, and crucially what province you ‘belong’ to) was not clear enough. This meant a two hour taxi ride along the bumpy skiddy snowy roads to her home town, to get the bloody thing re-stamped. Her father had to leave his work to come and do that. Then we had a surprise family lunch, and then got the same taxi back to Changchun. Her Dad gave us a small vase that he says is Qing Dynasty (around 300 years old). All papers in order, we arrived at the office at 3.45pm, to find that they would be closing at 4. We were able to start the process, signing this and that, going from this floor to this floor, and paying some money (28 quid) to the cashier on the 15th floor…. Then we had to go and get a hotel, half the papers done, instead of going back to Beijing. It was a very nice hotel with a big picture of Keith Richards, gypsy pose, blowing smoke into the camera in the lobby (Not seen a picture of him for a while, i wonder how old he looks now, he must be pushing 70?) We stayed in and watched The Manchurian Candidate on cable TV. The next day we went back first thing, and signed the rest of the papers. There was a room where we had a photo taken, with a nice bunch of flowers. No we didn’t want the deluxe gilded photo album for 500Y thankyou. An old Japanese American was ‘re marrying’ his Chinese Wife, after 30 years of marraige. They had had to divorce, as their American wedding didnt count in China or Japan apparently, and get married again, as they were off to settle in Japan. Still there were further delays for us. I don’t think I’ve signed my name so many times. They then go off and make a red marraige book for us, with tonnes of stamps in it, like a passport. They like books here. More stamps. 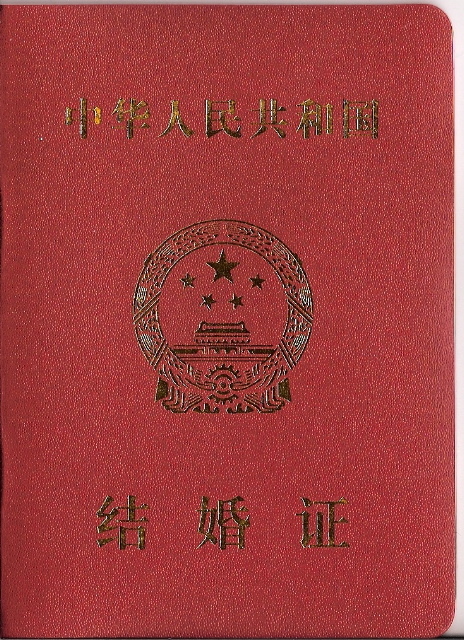 We needed a certified English translation of the document, and were feeling like we wanted more red stamps for our collection. We were asked which “kind” we needed. No idea. We went for the cheapest. That was going to take a further three hours, plus a lunch break for the officer. Off we went to find the Pizza Hut I had seen by the train station. Excellent pizza. We sat there for over two hours. They had free top ups of fresh coffee. Buzzed up on caffeine, we went back to get our translation. All done, March 17th, St Patrick’s Day I believe. Went and got the train tickets (20 minute queue outside, icicle on my nose), 6 hour ride back to Beijing (wife feeling very ill, too much cheese, coffee and cake), argued with a taxi driver at Beijing who wanted to rip us off, made it back to our block 2 minutes before midnight, when the lift man signs off and you have to walk up 18 flights of stairs. It feels good to be married!